More Amtrak lines are allowing this. They’re the smallest and the biggest vehicles many people use during their lives, and they keep becoming a better travel pair. 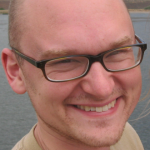 A free event Wednesday evening will bring a rail-riding college student to Portland to talk about various aspects of bicycle-and-train travel. 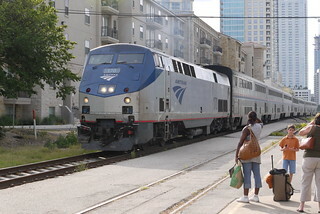 The latest major improvement on this front in the United States is Amtrak’s expanded roll-on bike service, a 2013 shift by the national passenger rail company that came after years of advocacy from people who saw the potential. PORTLAND – Zipcar, the world’s leading car sharing network, the Oregon Department of Transportation (ODOT) and Amtrak Cascades today announced the launch of “Zip and Ride,” a partnership to locate Zipcars within walking distance of three Amtrak train stations (Portland Union Station, Salem Station, and Eugene Depot) and promote more connected, cost-effective travel options for train riders. Government employees commuting or traveling for meetings between Eugene, Salem and Portland for work can take the train to their destination, then pick up a Zipcar at the train station and drive around town for meetings or site visits. Local business employees can travel to work via train, then reserve a Zipcar to run supplies between offices or meet with clients. Zipcar has vehicles of all shapes and sizes to meet every trip’s needs. 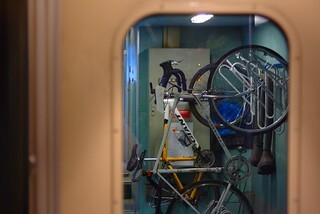 Bike commuters can board Amtrak Cascades with their bikes, then reserve one of Zipcar’s Yakima bike rack-equipped vehicles to complement their trip. “Oregon is a national leader in sustainable and innovative transportation, and this partnership provides yet another ‘green’ option. Drivers can avoid I-5 congestion and take Zipcar for convenience and flexibility at their destination, all while enjoying free time and comfort on the train with Amtrak Cascades’ bistro and free Wi-Fi service,” said Hal Gard, Administrator for ODOT’s Rail and Public Transit Division. Zipcar gives its members on-demand access to a fleet of 12,000 cars in hundreds of cities, as well as colleges and university campuses worldwide and major airports throughout North America and in Europe. Zipcars are available 24/7 for reservation by the hour or by the day via Zipcar’s mobile app, online, or over the phone. Prospective members can join the service instantly on Zipcar’s mobile app, and Oregonians can now take advantage of special “Zip and Ride” membership and reservation rates. For more information on “Zip and Ride,” visit www.zipcar.com/zipandride. One of the country’s most-ridden Amtrak lines could have its southern tail chopped off unless Oregon legislators find another $5 million to keep it whole. 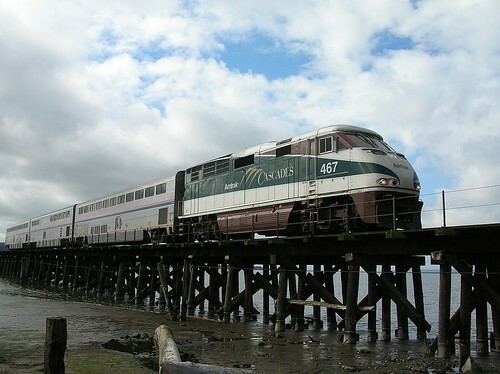 The state-sponsored Amtrak Cascades service between Eugene and Portland, with stops in Albany, Salem, Woodburn and Oregon City, is likely to be eliminated unless the state is willing to cover the one-third of the line’s operating costs, $28 million annually, that aren’t covered by ticket revenue. 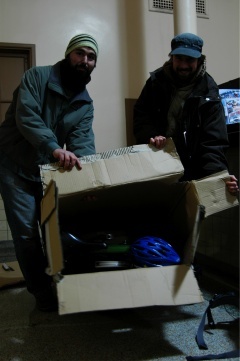 A late-night incident in which Amtrak workers awoke two Portlanders to tell them, incorrectly, that their folding bikes weren’t allowed as carry-ons has led the agency to clarify its policy. The maximum dimensions are 34 inches by 15 inches by 48 inches, as stated in Amtrak’s policy. Mass-market folding bikes meet those constraints, Dean Mullin of local shop Clever Cycles said Wednesday. 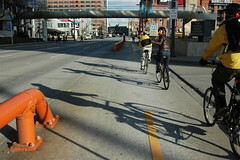 and fascinating — like this ride in Baltimore. The holiday travel season is coming up. If you’re leaving Portland, maybe you’ve thought about bringing your bike along for the trip this time. A bike doesn’t make sense for every trip or every destination. But if it does fit in with your plans, the experience of traveling with a bike comes highly recommended. A bike can give you independence, flexibility, adventure, and a surefire way to meet people wherever you go. 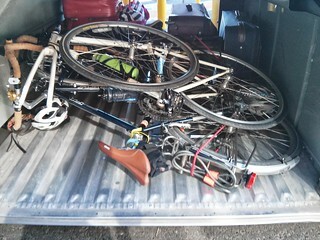 I’m beginning to realize a few things about traveling with a folding bike. First of all, it’s definitely a passport to general goodwill and friendliness. I had a great time chatting with a homeless guy and a college student on the L’s blue line last night at 1am. It’s hard to imagine the three of us in that circumstance getting into a friendly conversation without the Brompton.